I have just returned from France (more about that soon!) 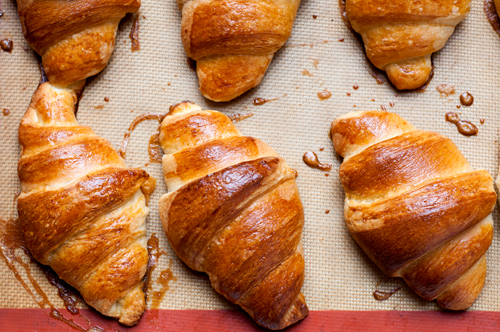 where the croissants are tender, flaky, buttery, and available just about everywhere. Having been to France before, I knew what a treat I was in for, so to help me get in the French frame of mind, I made homemade croissants the week before I left. This isn’t something you want to do every day – in fact, it’s a multiple day process to make laminated dough. But I was baking for a family gathering when all my kids were home (rare!) so I wanted to do something special. 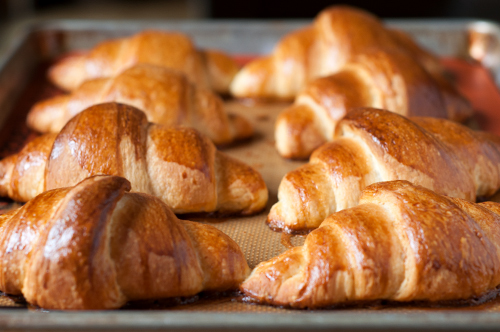 I’ve made croissants only once before, at pastry school probably 10 years ago, so I felt I needed a refresher and ended up following Laura Vitale’s recipe after watching her instructional video. The dough is easy to make as you basically dump everything together into the mixer with the dough hook and let ‘er rip. I did find I needed more liquid (I’m sure because of Colorado’s dry climate), and I wish I had thought that through ahead of time. The dough should be kind of sticky and soft, so if yours is too stiff, it’s in need of more liquid. A word of caution on dough: it’s always easier to add a bit more flour by kneading it in if it’s too sticky to roll out, but it’s very hard to add more liquid once the dough has come together. 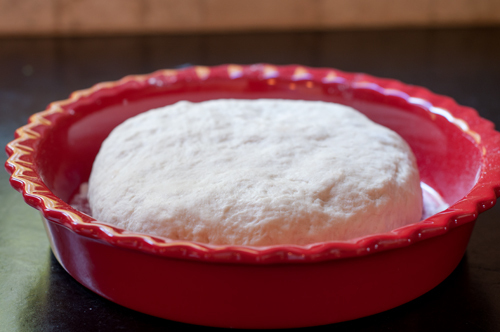 The dough needs to rise 6 hours or overnight before rolling it out into a 10-inch square the next day. 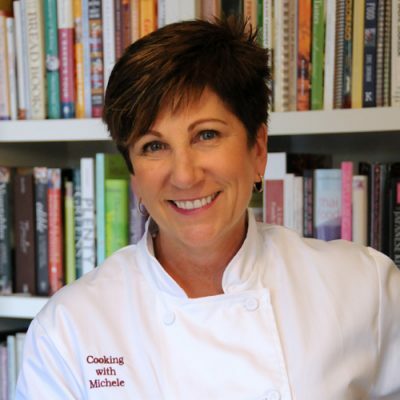 Your butter needs to be rolled out between sheets of parchment paper into an 8-inch square and chilled. The next day, you’ll lay the butter over the dough, and bring the edges of the dough up to seal around the butter like a package. And then you start rolling out dough – and I mean rolling out dough. You roll it into an 8 x 24 inch rectangle, then fold it in thirds like folding a letter, and then cover with plastic wrap and refrigerate. You do that 3 more times and on the last rolling out, you wrap it and refrigerate it overnight. The next day you are going to roll it out into an 8 x 48 inch rectangle (it’s easier to cut in half and work in 2 batches) before cutting into 16 triangles of dough and rolling them up into croissant shapes. Cut the rectangle into 6 inch pieces so you’ll have a total of 8 6-inch pieces, and then cut those diagonally into 2 triangles. I found I had to sort of roll out the triangles a bit so that the tip is centered and you can roll them up from the wide end to the tip, pinching the tip to seal it and placing it tip side down on the pan. Let the croissants rise for about an hour in a warm place (I like the oven with the light on, but the over turned off, as the light adds just enough heat to make dough rise). After they are nicely puffed, you’ll need to brush the croissants with an egg wash (or with heavy cream if you are allergic to eggs like my daughter’s boyfriend) before baking them for 20 minutes, rotating the pans halfway through to ensure they cook evenly. Like I said, this isn’t an every day project. But if you are looking to challenge yourself a bit – and develop some killer arm, shoulder, and back muscles by repeatedly rolling out dough – then this is the project for you! Combine the flour, yeast, sugar, and salt in the bowl of a stand mixer and stir to combine. Add the softened butter and turn the mixer (with the dough hook) on low. With the mixer running, slowly add the milk and continue adding milk until a soft, slightly sticky dough forms. Let the mixer run for a couple of minutes to knead the dough, then remove it to the counter and knead it a few minutes more before patting into a circle. Sprinkle flour on the bottom of a baking dish, cover, and refrigerate at least 6 hours or overnight. Place the cold tablespoons of butter into a square on a large piece of parchment paper and cover with another large piece. 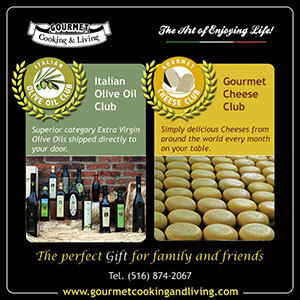 Use a rolling pin to roll the pieces into a flat 8-inch square of butter, and the refrigerate the butter (leave it in the parchment) overnight with the dough. 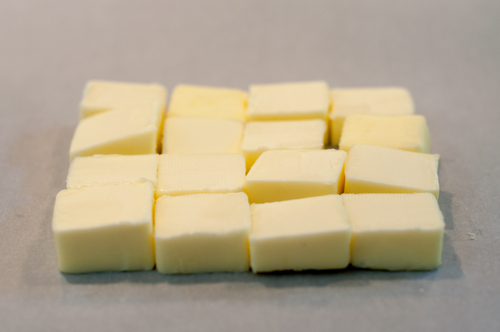 Roll the dough out into a 10-inch square and place the cold butter square on top so that the corners of the butter face the flat sides of the dough. Pull up all four sides of the dough, pinching together to wrap the dough around the butter. On a lightly floured surface, roll into an 8x24-inch rectangle, brush off excess flour, and fold into thirds like folding a letter. Refrigerate for 30 minutes, then repeat 3 more times. After the last folding, refrigerate the dough (covered in plastic wrap) overnight. The next day, roll the dough into an 8x48 inch rectangle (or cut in half and roll into 2 8x24 inch rectangles). Cut every 6 inches across the rectangle, then cut each piece diagonally into 2 triangles. 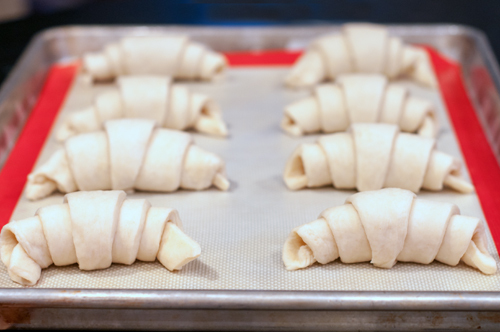 Gently stretch or roll the triangles of dough so that the point is centered, then roll up from the wide end to the point, pinching the point to seal, and placing the croissants point side down on a parchment paper or silpat lined baking sheet. 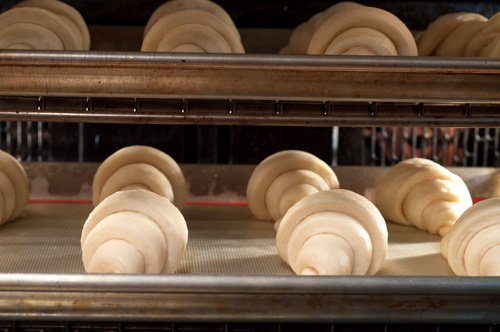 Let the croissants rise for about an hour in a warm place. 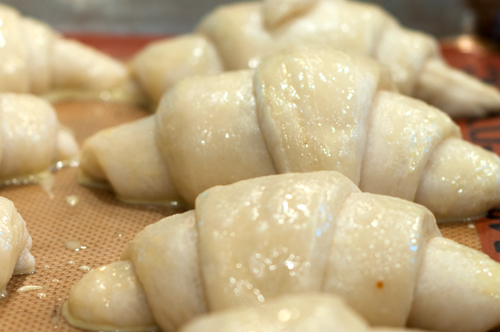 Brush the croissants with an egg wash or heavy cream and bake at 400 degrees for about 20 minutes, rotating the pans partway through to ensure even browning. I’ve ordered French butter croissants on QVC that were flown in from France the next day…all you do it bake them…..fantastic!